Superfoods are an excellent, quick and easy way to fill your body with nutrients. What exactly is a superfood? 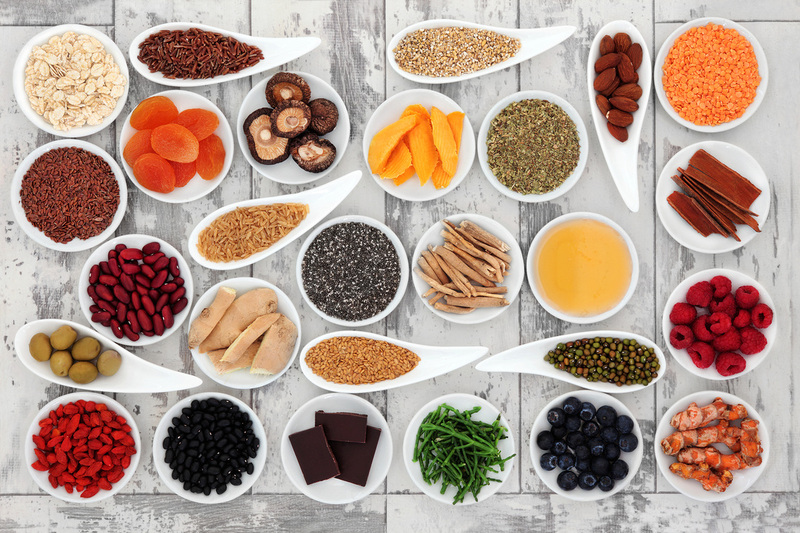 Simply put, superfoods are foods rich in phytochemicals which fight disease, strengthen the immune system and contribute to an overall healthier well-being. So, how can you get more of these superfoods? I personally love adding them to my smoothies (which I share recipes for on snapchat –> @gerihirsch) to supercharge my mind and body. I add about a teaspoon or so of a combination of the below 11 superfoods for all sorts of great health benefits which include lowering cholesterol, reducing inflammation, improving digestion, increasing metabolism, eliminating toxins from your body, improving brain function, vision, mood and many other benefits which you can read about below. So, before you hit the blend button, consider scooping in a teaspoon of one or a combination of the following superfoods. Chia seeds are an ancient food from Central America and Mexico. The Aztecs cultivated the chia plant and the seeds were a staple of their diet, alongside maize. These small seeds are very high in fiber, which makes them good for weight loss and weight maintenance. They are also high in healthful omega-3 and omega-6 fatty acids. Chia seeds also have a significant amount of protein, no cholesterol, and several important minerals. Add a couple of tablespoons of chia seeds to your smoothies and you will get many benefits. They can control your blood sugar levels, prevent blood clots, reduce high blood pressure, reduce inflammation, improve your digestion, and give you energy. The health benefits of coconut oil come as a surprise to many. We have long been told to avoid saturated fats like the plague, but the experts were wrong about this one. Coconut oil is high in saturated fats, but in spite of that it has been proven to aid weight loss, lower LDL, or bad cholesterol and raise HDL levels, and even help to reverse the course of Alzheimer’s disease. Coconut oil has also been shown to have an antibiotic effect. In studies, it helped to treat pneumonia and to kill the bacteria that cause acne. You can store coconut oil much longer than other oils because it does not go rancid easily. Add a tablespoon to a fruity or chocolate smoothie and you will enjoy the subtle flavor of coconut as well as all these health benefits. Acai berries are the fruits of the acai palm tree, which is native to the Amazon region. These dark red fruits contain more antioxidants than any other food we know, including red wine, blueberries, and dark chocolate. Additionally, acai has few calories, plenty of fiber, proteins, trace minerals, and monounsaturated fats. They have been shown promising in preventing atherosclerosis, lowering cholesterol, and killing cancer cells. Use the frozen pulp of acai in your smoothies to get the whole food without added ingredients. Pair it with cacao or other fruits and add a little natural sweetener to bring out the rich, fruity flavor of these berries. The aloe vera plant, mostly known as a product for easing the pain of a sun burn, is a potent medicinal plant. The gel, which comes from the inside of the thick leaves, has been shown to have a number of powerful medical effects. These include slowing tumor growth, lowering cholesterol, reducing inflammation, preventing kidney stones, relieving muscle and joint pain, improving digestion, relieving constipation, stabilizing blood sugar levels, and hydrating with electrolytes. For your smoothies, you can buy aloe vera leaves at the grocery store. Cut back the outside of the leaves to get to the gel inside. You can add it to any smoothie without changing the taste. Cacao is the seed of the cacao tree, which grows in Central and South America. They are often called beans and are the flavor behind everything chocolate. Most chocolate products do not count as superfoods because the processing has eliminated much of the nutrition. If, however, you get raw cacao, you have a minimally processed food that is packed with nutrition. Raw cacao contains flavonoids, a type of antioxidant that can improve your health in a number of ways. Cacao has been shown to increase blood flow, lower bad cholesterol levels while raising levels of the good type, lower blood pressure, regulate blood sugar, and improve brain function, vision, and mood. Add cacao to a smoothie, but do not expect it to be sweet. Raw cacao is bitter and needs a little natural sweetener. Also known as wolfberries, these tasty red berries are an excellent choice for any fruit-based smoothie you concoct. They are native to Asia and have been used there for thousands of years. The people of China, India, and Nepal have long realized that these berries are special. They are packed with protein, vitamins, minerals, and antioxidants. Goji berries are an excellent plant-based source of protein, and are perfect for vegetarians and vegans. They can help protect you from heart disease and improve your eye health. Goji berries have some interesting compounds not found in many other foods. A class of oils called sesquiterpinoids that is found in goji berries boost the production of human growth hormone, which produces anti-aging effects. Other components of the fruit can improve the functioning of your immune system and even help patients with serious autoimmune disorders. Goji berries taste great in any fruit-based smoothie. Hemp seeds come from the cannabis plant, which is also the origin of marijuana. Plants that are used for hemp products contain little or none of the psychoactive compound THC. Hemp seeds contain omega-6 and omega-3 fatty acids, which are good for combating heart disease. They also contain so-called “super” fatty acids called gamma-linoleic acid and stearidonic acid. These fats are good for your skin, help to increase your metabolism, lower cholesterol in your bloodstream, and decrease inflammation. Hemp seeds are also high in protein and fiber. They have been shown to improve immune system functioning, improve brain health, and regulate blood sugar. With a mild, nutty flavor, you can add some to any smoothie. Both honey and bee pollen, which is the mixture of pollen that bees collect from flowers and enzymes that they add, are both potent superfoods. Honey has strong antibacterial properties and contains antioxidants. In fact, honey can be applied to wounds to speed healing. Honey can also combat seasonal allergies if you use a product that is made in your area. When you have a cold, honey can ease coughing and the inflammation of a sore throat. Bee pollen is a good source of protein, vitamins, and minerals. It has been used to treat asthma, indigestion, anemia, acne, arthritis, and fatigue. Like honey, bee pollen may help with allergies. Both products are easy to add to smoothies, as they provide a natural sweetness that enhances any other flavor. Doctors recommend that you never give any amount of honey to an infant. Maca is a root that grows in the Andes Mountains of Peru. The natives of the region have long recognized the health benefits of this root. Today you can buy it in pill, powder, or liquid form. The powder is a good choice for smoothies, and you can add a tablespoon or two to any recipe. One of the main reasons the native Peruvians used maca was to enhance virility. It is thought to improve energy and mood, lower stress, and to increase sexual function and fertility. In addition to these positive effects, maca is rich in protein and B vitamins, which makes it a great supplement for vegans and vegetarians. Maca also has vitamins C and E, calcium, iron, zinc, magnesium, and phosphorous. Another superfood used by the Aztecs, spirulina is an ancient type of blue-green algae that grows in lakes around the world. The Aztecs learned to harvest it and use it as an important source of nutrition. It is high in protein, omega-6 and omega-3 fatty acids, B vitamins, vitamin E, vitamin K, beta carotene, zinc, copper, iron, and trace minerals. Spirulina can relieve allergy symptoms because it blocks histamine production. It can also improve the functioning of your immune system and help bring relief to people suffering from autoimmune disorders. Spirulina also acts like a sponge for toxins and can remove heavy metals from the body. You can get powdered spirulina and add it to any smoothie. Try using it with ingredients that have strong flavors, as many people do not like the taste of the algae. Flax seed is best known for its fatty acids and fiber. When talking about omega fatty acids it is better ask what they can’t do then what they can. This powder plays its part in proper cardiovascular and immune system health, brain function, joint function, soft skin, and more. The fiber in flax is also good for many things, but especially effective with eliminating toxins from your body. this post couldnt come in a better time! Yummy! All these foods look so delicious! =) Time to make a smoothie…. list of superfood, it’s really useful and informative! Love this article, very useful! I just started adding coconut oil to my granola and even using it for my face. It is definitely one super food! very helpful and inforamtive blog post! thanks so much for sharing it! Thank you! This is very good to know as I have just started making smoothies and was getting tired of the same one. I will definitely experiment with these! chia seeds & goji berries are high in lectins w/ no way to remove. Also, goji berries are in the nightshade family, which some people could be allergic to. Read The Plant Paradox by Dr Gundry.